At a recent Insight Conference, health care administrators varied in their response to Lean – some continue to be enthusiastic boosters while others found it time consuming and hard to sustain. Others lamented the front line support staff were being left out of the process – a fatal flaw given insights they gain from direct contact with patients. There is no question that the culture of an organization is going to be key to whether such processes actually work. It is important to note that the dysfunctional Windsor Hotel Dieu had already implemented Lean. When workers cannot find a voice in their workplace, they turn to the union. When the union finds it is not being listened to, frequently we turn to the public (such as in this BLOG). There is no greater disinfectant than public scrutiny. The issue of employees speaking to the media has come up recently at the Wellington Waterloo Community Care Access Centre, which is opening its board meeting to public input tentatively on October 24th. The WWCCAC is being called upon to review a media clause in the Ontario Association of Community Care Access Centre contract templates with contract home care agencies that forbid any employee of that agency speaking to the media about CCAC services without advanced approval from the CCAC. At Ontario Shores Centre for Mental Health Sciences a staff member was given a three-day suspension for sharing over his private dinner conversation an incident that took place at the mental health hospital. No patient confidentiality was breached with his spouse (the story came back around when his spouse repeated the story in a private conversation elsewhere). This strikes us as completely over the top in the hospital’s attempt to bolster a crumbling public image – and perhaps not entirely coincidental to recent public disclosure on this BLOG. A few years ago we had a conversation with a senior LHIN employee over issues on this BLOG. We asked him why he didn’t simply post a reply? The whole point of our BLOG is to create a discussion. He felt he couldn’t in his role with the LHIN. If the Minister of Health really wants to improve health care, she should take off the gag, improve whistleblower protection, and open hospitals and other health care providers up to the scrutiny of the Ontario Ombudsman. 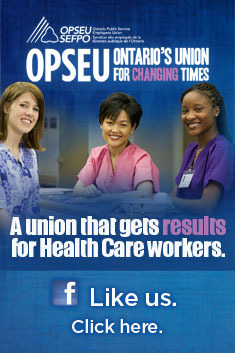 Ontario is the only province where the ombudsman does not have jurisdiction over public hospitals. If nobody else will listen, likely the Ombudsman will. The Minister should also tell the CCACs – a creature of government – to get rid of that stupid clause. It’s about time. And if you want to leave a reply, please do so no matter who you are. Comments are vetted, but only for issues of libel or comments that may be taken as bullying other readers (such as name calling). This entry was posted in Uncategorized and tagged David Williams, Gag clause, Ken Deane, Lean, Ontario Association of Community Care Access Centres, Ontario Shores, WWCCAC. Bookmark the permalink. not only are staff unable to whistle blow, they are not listened to when they speak to management about ideas they have to improve patient care or even save money. In the past patients who had complex surgery remained in the hospital until their incisions had healed. nowadays they are sent home and more often than not have to be re-admitted because they have developed an infection or other serious problem such as bleeding,swelling etc. How does this save money? “Lean…” So this is their latest “Buzz Word” to describe the deplorable conditions in our Health Care System? Intimidation tactics to silence workers…”Lean.” Disciplinary action (as per 3 day suspension of Ontario Shores employee for dinner conversation) “Lean.” CEO salaries and unexplained financial bonuses that make you choke…”Lean?? ?” The only thing “Lean” that I can see is the transparency, competence, accountability and hope for the sustainability of our Health Care System. The system needs to clean house, starting with the exile of all these high ranking government and administrative bandits before they reduce our health care system to that of a 3rd world country. We all know what you are trying to hide, despite best efforts to gag workers, word is leaking out like an erupting wound. Staff is standing up and speaking out despite the intimidation tactics employed by your adjudicators. A few corrections to note: The WWCCAC has agreed to a full briefing of the media clause at their next meeting. This is Nov. 28th, not Oct. 24th. (The October board meeting was cancelled.) The board meeting is open to the public, but comments from the public are not allowed in the meeting. The meeting location is 141 Weber Street S. Waterloo. The open session starts at 4:30 pm unless otherwise posted. Check WWCCAC notices at http://bit.ly/UVmvW0 to make sure of the start time. A relevant editorial on the topic of the media clause can be found at http://bit.ly/USStxr . (Copy and paste links to browser if necessary). Another correction is that the media clause is NOT imposed on employees of the CCAC. It is a clause in contracts with INDEPENDENT service provider organizations who then discourage their contracted health-care workers from speaking out. In my view, this is a far over-extended and unconstitutional gag order which hurts all stakeholders. Waterloo-Wellington region citizens concerned with free-speech and local health-care issues are encouraged to attend the open session to show support for the removal of the media clause. My earlier post should read “updates and clarifications” rather “corrections”. Your original blog is well worded, and appreciated.